Dr. Christopher L. Holoman delivers his inaugural address in the Centenary Gold Dome on Friday, March 17, 2017. SHREVEPORT, LA — Centenary College of Louisiana inaugurated its 31st president, Dr. Christopher L. Holoman, on Friday, March 17. A week-long celebration of the College’s nearly 200-year old academic traditions culminated in a day marked by a United Methodist worship service, a formal inauguration ceremony in the Centenary Gold Dome, and an afternoon reception that took full advantage of the early spring scenery on Centenary’s beautiful campus. Holoman topped off the evening by delivering the first pitch of the #11 Centenary Gents’ 10-6 victory over Southern Collegiate Athletic Conference foe Schreiner in the conference home opener at Shehee Stadium. At the 11:00 a.m. worship service in Centenary’s Brown Chapel, faculty, staff, students, alumni, friends of the College, and many members of Holoman’s family gathered to hear scripture readings from students and an inspiring message from Bishop Cynthia Fierro Harvey of the Louisiana Conference of the United Methodist Church. Harvey praised Centenary for its tradition of educating and preparing principled leaders who are not afraid to “reach into the margins” and take action to help “the least and the lost.” Harvey expressed her conviction that Holoman’s leadership at Centenary will nurture this tradition. The Reverend Dr. Wybra Price, Shreveport District Superintendent of the UMC, presided over a blessing of Holoman during the service, and retired Bishop William Hutchinson offered the benediction. College organist Dr. Hollice Watson and the Camerata choral ensemble under the direction of Dr. Cory Wikan provided music for the moving ceremony. Centenary alumni, friends, and an enthusiastic cohort of current students greeted Holoman in the Gold Dome for the formal inauguration ceremony on Friday afternoon. Shreveport Mayor Ollie Tyler offered greetings from the local community, while former Centenary provost Dr. Darrell D.Colson, now the president of Wartburg College in Iowa, spoke for the national higher education community. Messages of support and welcome were also offered by MaryAnn Coleman, president of the Louisiana Association of Independent Colleges and Universities, Bishop Cynthia Fierro Harvey, and by individuals representing the Centenary Board of Trustees, faculty, staff, alumni, and students, respectively. Holoman’s daughters, Allie Fritz and Fran Holoman, spoke on behalf of the president’s family and thanked the Centenary and Shreveport-Bossier community for welcoming and embracing their parents. Holoman arrived on campus and began serving as president in July 2016, but his installation as Centenary’s leader was formalized during Friday’s ceremony when he publicly received three important symbols of the College: a reproduction of the College charter, the College mace, and a medallion bearing the College seal. Centenary presidents emeriti Dr. Donald A. Webb, Dr. Kenneth Schwab, and Dr. B. David Rowe were in attendance to present Holoman with the charter, while faculty members Dr. Harold Christensen and Dr. David Thomas presented the mace. George D. Nelson, Jr. and David Barlow presented the medallion on behalf of the Board of Trustees. 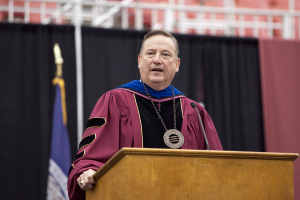 Holoman delivered an inaugural address that centered on the Centenary College community’s shared purpose as a liberal arts college in the 21st century. The inauguration ceremony concluded with the Centenary alma mater and the traditional benediction, The Lord Bless You and Keep You, performed by the Centenary College Choir under the direction of Dr. David Hobson. Centenary is continuing the celebration of this milestone in the College’s history and commemorating Holoman’s presidency with the “31 for 31” campaign, a focused initiative to raise $310,000 for the Centenary Fund for Student Scholarships. A generous donor has already provided 10% of the campaign goal with a gift of $31,000. The campaign runs through June 30, and more information is available at centenary.edu/31for31. Visit Dr. Holoman's page on the Centenary website for videos and text of his inaugural address. Photo galleries from the inauguration events are available at centenaryla.zenfolio.com/inauguration.